I've decided that this week is going to be a week for finishing some projects! I have been keeping a running list of current projects for a while, and the other day I rewrote it. I still have 15 UFOs. (I had 15 a week and a half ago, I swear I've finished things since then. Oh yeah, started things too.) Thing is, I'm really close to done on at least 5 of them. I just finished a year-old project on Friday , and loved getting that thing done! I have been thinking about maybe making a few/some/couple handmade holiday gifts this year, but I have got to whittle down my UFO pile first. I'm going to shoot for one finish a day to start (yeah that's how ridiculously close I am on some of these things) and see how the week goes. 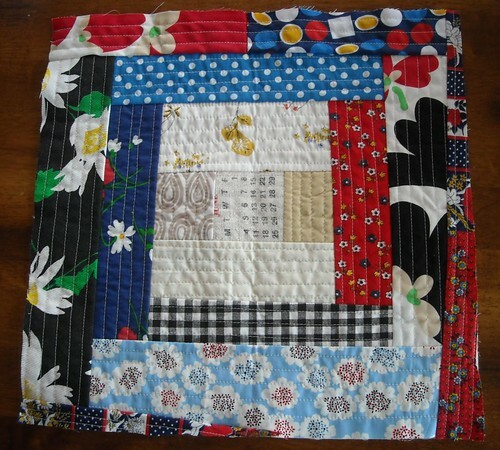 *a Quilts for Kids quilt (this one will take some time and effort--top is pieced but still needs borders, and then basting/quilting/binding/mailing! Ok I better stop there. I'd love to get my unfinished list under 10 in a week. Does anyone else want to join me for UFO week? p.s. don't forget, IBOL boxes need to be mailed out this week as well! I have my box, just need to spend some time putting it together. That looks like an almost manageable list! Good Luck! 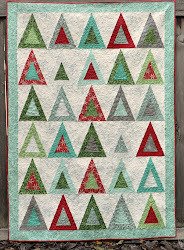 Maybe I'll do a little work on one of my long-term UFOs (I really REALLY hate the fabrics in this quilt, and I made the mistake of doing very close-set quilting lines so it seems to take even longer!) this week too...we'll see. Good luck! i have so many UFO's right now that i don't want to think about it but i want to get as many done as possible before we have a baby.